Polycyclic aromatic hydrocarbons (PAHs) are very toxic and persistent environmental contaminants. The paper is aimed at investigating the PAHs levels in soil collected at 0–30 cm depths from 5 automobile repair workshops within Eket metropolis/the underground water around its vicinity. The soils and water were prepared in the laboratory following standard procedures and were analysed for 16 US EPA priority PAHs using Gas Chromatography–Mass Spectrometer (GC–MS). Total PAHs concentrations in soil (Ʃ16 EPA PAHs) from all sampling sites were in the range of 0.82–12.98 mg/kg and 0.47–14.85 mg/kg for both dry and rainy seasons respectively and did not follow regular pattern with depth. Total PAHs concentrations in underground water from all sampling sites were in the range of 1.71–16.07 mg/l and 1.07–12.97 mg/l for both dry and rainy seasons respectively. According to European commission contamination classification and WHO maximum permissible limit for PAHs in drinking water (0.002 mg/l), the sites are said to be moderately to heavily contaminated. The total BaPeq for the soil and water samples indicated a moderate carcinogenic burden and hence low health risk. The calculated values obtained from diagnostic ratios shows that the PAHs in this study were from both pyrogenic and petrogenic sources. The correlation between total PAHs concentration in soil and water for both seasons indicated that the automobile repair activities had a moderate effect on the soil as well as the underground water around it. Therefore, boreholes should not be sited close to automobile repair yards to enable its suitability for domestic, irrigation and recreational usage. Automobile makes up one of the most useful means of transportation for man, goods and services worldwide. The usefulness of this mode of transportation is not without cost which includes pollution of various magnitudes. This cost according to Halls  can be classified into two (2) main groups namely operational cost and the maintenance cost. When vehicles are driven from one place to another, operational cost of the automobile transportation is involved while during vehicle repairs, maintenance cost is involved. 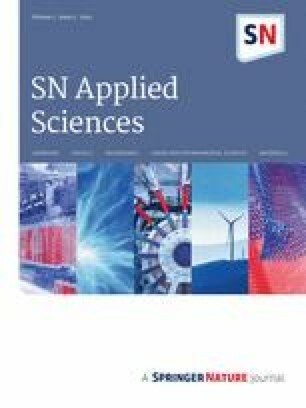 International conferences and meetings concentrated more on the reduction of operational cost of automobile pollution by introducing alternatives such as the use of ethanol and hydrogen fuels for powering automobiles, removal of lead from gasoline, use of electric trains for urban transportation etc. Most of these have been implemented in some developed countries while some are yet to implement or interpret into local contents . Less attention is paid to pollution caused by maintenance or vehicle repairs (auto mechanic activities). There are actually greater amount of pollution arising from the intensive operations of this automobile or auto-mechanic activities . There are widespread cases of petroleum hydrocarbon contamination in Nigeria and in many other countries. Pollution due to disposal of used engine oil is more common and prevalent than that of crude oil; this is a serious environmental problem in Nigeria and calls for urgent attention . Contamination may result from mishandling, deliberate disposal, spilling and leakage of petroleum products such as gasoline, lubricating oils, diesel fuel, heating oils, used and spent engine oil. These unguided practices of indiscriminate disposal have worsened the rate at which used engine oils spread and contaminate the soil and water around the town. Researches has showed that used oil is less viscous than unused oil; as such when improperly disposed into the soil, absorbs to the soil particles, reducing porosity and therefore reduces aeration of soil . The pollution of environment by Polycyclic Aromatic Hydrocarbons (PAHs) is a serious environmental issue especially by automobile sources . This is due to the health implication of their presence since they are not required for any function either by plants or animals. PAHs can either be synthetic or occur naturally (found in the air, water and soil) . As population and technology increases and improves, there is also an indirect increase in environmental pollution causing a continuing and accelerating decline in the quality of the environment and its ability to sustain life. Akwa Ibom State being one of the most populated states in Nigeria has resulted in an increase in number of vehicles that are used for commercial and private purposes. Since vehicles are prone to breakdown, portions of land are used by individuals or groups of people for small and large scale automobile repair workshop to offer services to the public. It is presumed that there are environmental threats associated with this practice. Studies on automobile repair workshop sites have been carried out by many researchers such as Adelekan and Adegunde , Odoh et al. , Gyan and Ofosu , Ipeaiyeda and Dawodu , Ilemobayo and Kolade  etc. Most of them focused on studying the implication of heavy metal contamination in soil by automobile repair activities, without considering the effect of petroleum hydrocarbon pollutants such as the persistent and ubiquitous Polycyclic aromatic hydrocarbons (PAHs) present in the used oil. PAHs being a by-product from mechanic activities are usually carcinogenic even at very low concentration. Leaching through soil and surface run-offs have been observed to be the major sources which Polycyclic aromatic hydrocarbons (PAHs) enters underground water, fresh and marine surface waters . This has posed serious effect on human health. In 2015, PAHs ranked 9th on the list of Agency of Toxic Substances and Diseases Registry as most threatening compounds to human health . Hence in the present report, the focus is on the assessment of the extent of pollution caused by mechanic activities to the soil (at various depths) and underground water in these automobile repair areas. Eket is the second largest city in Akwa Ibom State, Nigeria. It has a land size covering an area of 176 km2 and with human population of 364,489 as at 2013 projected population. Figure 1 shows the location map of the study area. The area enjoys the influence of maritime which is all the year round. Rainy season occurs between March and October with a short dry season from November to February. Eket has mean annual rainfall of 2484 mm and mean yearly temperature of 29 °C. It has relative humidity range of 70–80% . Geologically, Eket is located within low land coastal plain region of Nigeria. It has on the average, a flat terrain of 61 m above mean sea level . The stabilized ground surface has greatly increased the rate of rainfall infiltration into the ground. In some locations, boreholes are sited near mechanic workshops with little or no consideration to the possibility of the groundwater contamination through seepage . 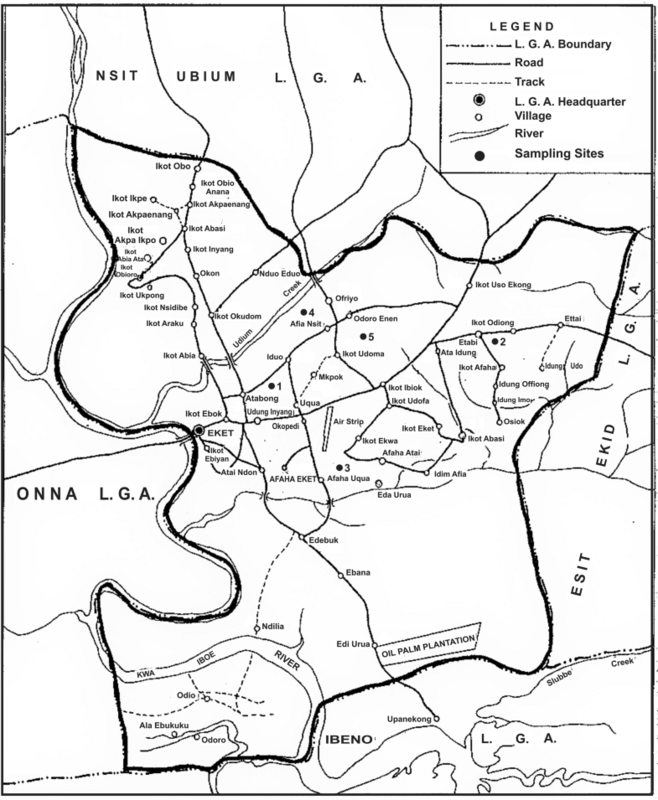 Since groundwater pollution status of an area is influenced or controlled by some factors such as topographic slope, groundwater table variation, soil porosity, permeability of the aquiferous layers, the type and quantity of waste and land use activities, sampling sites was narrowed down to five (5) mechanic workshops within Eket metropolis namely: (1) Mechanic workshop at Nkubia Street (NK) (2) Mechanic workshop at Etebi Idung Iwak Street(EIW) (3) Mechanic workshop at Edem Udo Street (EU) (4) Mechanic workshop at Grace Bill road (GB) and (5) Mechanic workshop at RCC Road (RCC). All chemicals used were of Analar grade and of highest purity. Reagents used include Hexane, dichloromethane, alumina (GC grade) as desiccant, conc. H2SO4, anhydrous sodium sulfate and organic free reagent water. A standard mixture of the US EPA 16 priority PAHs purchased from Accu Standard, USA. The sampling areas were chosen in order to have an overall overview on PAHs contamination in the city of Eket. Automobile repair workshop was also selected with the assumption that they might be polluted with PAHs due to the type of waste generated which is one of the sources of PAHs. Sampling was done in both rainy and dry seasons. Soil samples were collected at different points in the Automobile repair workshops. Soil samples were collected in three sets with stainless hand held auger. One set which was the top layer was between 0 and 10 cm deep from the surface, second set which was the middle layer was collected between 10 and 20 cm deep below the surface and the third set which was the bottom layer was collected below the surface at depth of 20–30 cm. The replicate samples collected at each point were thoroughly mixed to form one composite sample. The samples were wrapped in aluminum foil and properly preserved until extraction and analysis. Water samples were also collected from residential area (not beyond 150 m away) around the vicinity of the five (5) mechanic workshops and stored in a precleaned labeled 1 l amber glass bottles fitted with screw caps in the laboratory. It was preserved in ice chest at − 4 °C until analysis. Prior to the extraction for PAHs analysis, the soil samples were air dried in a dust free environment at room temperature. The soil samples were pulverized with a porcelain mortar and pestle and sieved through a 2 mm mesh sized sieve. The reference method employed in the extraction of PAHs in soil was US EPA 3540C (Soxhlet extraction). Ten gram of the soil samples were blended thoroughly with 10 g of anhydrous sodium sulfate and placed in an extraction thimble. 200 ml of the extraction solvent mixture (Hexane: Dichloromethane in the ratio of 300:100 ml) was poured into a 500 ml round bottom flask containing one boiling chips. The flask is then attached to the extractor and the sample extracted for 16–24 h at 4–6 cycles/hour depending on the sample. The extract is allowed to cool after complete extraction . Prior to the extraction, the sample bottles were properly washed with detergent, rinsed with water and finally rinsed with solvent to remove the interferences. The water sample was filtered with Whatman filter paper to avoid debris. The reference method employed in the extraction of PAHs in water was US EPA 3510C . Using a graduated cylinder, 50 ml of each filtered sample was measured into a 1-l separatory funnel. A drop of concentrated H2SO4 was added to the sample in the separatory funnel to release the hydrocarbon components and 5 ml of extraction solvent (n-Hexane) was also added. The sample was shaken vigorously for few minutes with periodic venting to release excess pressure and allowed to stand for few minutes (10 min) to separate the organic layer (top layer) from the water phase (lower layer). The extraction was repeated two (2) times using fresh portions of solvent. The three solvent extracts were combined and transferred into a glass vial with screw cap for further treatment. The soluble organic matters were fractionated into aliphatic and aromatic fractions using a glass column packed with neutral alumina. 10 g of the alumina was packed into the column and properly cleaned with redistilled hexane. The extract was poured onto the alumina and was allowed to elute using the redistilled hexane to remove the aliphatic fractions into a precleaned 25 ml glass container. The aromatic fraction was recovered by using the mixture of hexane and dichloromethane in ratio of 3:1. The aromatic fraction was concentrated to approximately 1.0 ml using rotary evaporator. The obtained extract was stored in an organic free precleaned glass vials with screw caps for analysis. It was refrigerated at − 4 °C until analysis. Sample analysis was carried out using Gas Chromatography (GC) for 16 US EPA priority PAHs [Naphthalene(Nap), Acenapthalene (Ace), Acenapthylene (Acy), Phenanthrene (Phe), Anthracene (Ant), Fluorene (Flu), Fluoranthene (Fla), pyrene (Pyr), Benzo(a)anthracene (BaA), Chrysene (Chr), Benzo(b)fluoranthene (BbF), Benzo(k)fluoranthene (BkF), Benzo(a)pyrene(BaP), Indeno(1,2,3-cd)pyrene (IcdP), Dibenzo(a,h)anthracene (DbA) and Benzo(ghi)perylene (BghiP)]. 1 µl of the concentrated sample was injected into the GC for quantification of Polycyclic Aromatic Hydrocarbons (PAHs). The analytes were automatically detected as it emerges from the column by a mass spectrometer detector (MS) . Agilent chemstation software was used for data processing. Operational condition used for GC analysis is stated in the Table 1. Physicochemical parameters such as pH, soil porosity, soil particle density, bulk density and total organic carbon were determined using standard methods. Sample collection technique, preservation and sample transfer conformed to international standard. Analytical grade reagents were used for the analysis. The cooling system of the laboratory was maintained so as to attain the integrity of reagents and chemicals used for analysis. All laboratory equipment was properly calibrated prior to use, to ascertain the reproducibility of the analytical results. Sequence analysis were employed for all parameters accompanied with GC measures (such as blanks, duplicates and standards) to check interferences and validation of analytical procedures used. The concentration of the 16 US EPA priority PAHs were determined in the soil (at various depths) and water within and around the automobile repair workshops [Edem Udo (EU), Etebi Idung Iwak (EIW), Nkubia (NK), Grace Bill (GB) and RCC (RCC)] in Eket metropolis during both dry and rainy seasons. The result of analysis of the soil and water samples is presented in Tables 2 and 3. The minimum detection limit for GC/MS used in the analysis was 0.001 mg/kg. The mean levels and standard deviation were also calculated for individual and total PAHs for each location. The computation was done using Microsoft excels page and to minimize errors in the table, the values < 0.001 mg/kg were recorded as 0 (zero). Generally, PAHs do not exist as separate entities in environmental media. They are often regarded as a mixture and the total concentration of their mixture is often used to describe their distribution. 16 US EPA priority PAHs were determined in the soil within (at various depths) and water from houses around the automobile repair workshops in Eket metropolis during both dry and rainy seasons (Tables 2 and 3). In the dry season, the concentrations of PAHs in EU, EIW, NK, GB and RCC soil varied between Below Detectable Limit (BDL, < 0.001) to 1.10 mg/kg, < 0.001 to 0.87 mg/kg, < 0.001 to 0.52 mg/kg, < 0.001 to 11.22 mg/kg and < 0.001 to 0.91 mg/kg respectively. In the rainy season, the concentrations of PAHs in EU, EIW, NK, GB and RCC soil varied between < 0.001 and 3.18 mg/kg, < 0.001 to 0.40 mg/kg, < 0.001 to 0.37 mg/kg, < 0.001 to 13.51 mg/kg and < 0.001 to 2.69 mg/kg respectively. GB soil (18.51 mg/kg in dry season and 18.65 mg/kg in rainy season) recorded the highest total PAH levels (Ʃ16 EPA PAHs). This is due to the nature and level of activities carried out around this study area. Similarly, the levels of PAHs determined in EU, EIW, NK, GB and RCC water varied between < 0.001 and 12.29 mg/l, < 0.001 to 0.33 mg/l, < 0.001 to 0.75 mg/l, < 0.001 to 13.05 mg/l and < 0.001 to 13.92 mg/l respectively in the dry season. The levels of PAHs determined in EU, EIW, NK, GB and RCC water varied between < 0.001 and 8.35 mg/l, < 0.001 to 0.20 mg/l, < 0.001 to 0.95 mg/l, < 0.001 to 7.97 mg/l and < 0.001 to 10.05 mg/l respectively in the rainy season. The total PAHs in RCC water (16.07 mg/l in dry season and 12.97 mg/l in rainy season) recorded the highest. This might be as a result of the level of activities carried out and the physicochemical properties (porosity, pH and bulk density) of the soil at this study area. Generally, the Low Molecular Weight PAHs (LMW PAHs) were present in lower concentrations in all the sampling sites except Naphthalene in soil samples at GB study area. Naphthalene also was detected in high concentration in water samples collected at EU, GB and RCC in both dry and rainy seasons. Anthracene and phenanthrene among all LMW PAHs were detected in all the soil samples in both dry and rainy seasons except phenanthrene at RCC study area during rainy season. Although anthracene and phenanthrene were dominant in the water samples, they were not detected at NK and RCC study area in dry and rainy season respectively. The High Molecular Weight PAHs (HMW PAHs) were well distributed in almost all the samples analysed. This is due to their persistence in the environment and more PAHs could have accumulated within years. Pyrene and indeno(1,2,3-cd)pyrene had the highest total concentration in all the soil samples during the dry and rainy season respectively. Fluoranthene and dibenzo(a,h)anthracene were the least concentrated HMW PAHs in soil samples during the dry and rainy season respectively. In the water samples benzo(b)fluoranthene (0.93 mg/l) and indeno(1,2,3-cd)pyrene (0.95 mg/l) had the highest concentration among all the HMW PAHs during dry and rainy season respectively. Dibenzo(a,h)anthracene was not detected in any water samples in both seasons. This might be due to the lower concentration of dibenzo(a,h)anthracene in the soil samples. Generally, the concentrations of PAHs were higher in the soil samples in both seasons than in the water samples due to the hydrophobic nature of PAHs . Using scattered plot and determination of Pearson’s product moment correlation coefficient, there was a positive correlations between PAHs concentrations in soil and water in both dry and rainy season (r = 0.40 in dry season and r = 0.25 in the rainy season showing that the PAHs in the soil percolated into the underground water, thereby contaminating it. The compositions pattern of PAHs detected in the samples by the number of rings are shown in Figs. 2, 3, 4 and 5. In the soil samples, 2-ring PAHs were predominated in GB study area but was not well distributed. PAHs present in the soil samples did not follow regular pattern with depths of the soil in both seasons. Generally in all the soil samples, the 3-ring PAHs had the highest concentration, next to the two ring PAHs in the dry season. In the rainy season, on the average, the 2-ring PAHs had the highest concentration next to the 3-ring PAHs. The 6-ring PAHs had the lowest concentration in both dry and rainy seasons. As seen in Tables 4 and 5, PAHs levels in Eket was high at some specific locations which are GB (12.98 mg/kg in dry season and 14.85 mg/kg in rainy season) and EU (4.85 mg/kg in dry season and 4.74 mg/kg in rainy season). This indicates that the major source of PAHs contamination is mostly point source. All the various PAHs analysed in this study were found at this locations in both dry and rainy seasons except for acenapthalene which was not found at all in the soil samples in both seasons. The sum of 16 US EPA priority PAHs (Ʃ16 EPA PAHs) in water samples under study was high at some specific locations such as EU (14.25 mg/l in dry season and 11.93 mg/l in rainy season) and RCC (16.07 mg/l in dry and 12.97 mg/l in the rainy season) as seen in Tables 4 and 5. This was similar to the situation in the soil samples in this same location, thus showing that the PAHs may have been as a result of leaching from the soil. Dibenzo(a,h)anthracene was not detected in any of the water samples during both dry and rainy seasons showing that this PAH was not transferred from the soil to the underground water because of its low concentration in the soil samples. Two-ring PAHs had the highest concentration in the entire water samples but it was not detected in water samples obtained from EIW during the dry season. 5-ring and 6-ring PAHs were the lowest in concentration during both seasons. This was a similar case in the soil samples. The occurrence of the LMW PAHs in water is due to the dry deposition of particles from the atmosphere that contains adsorbed PAHs such as naphthalene and phenanthrene. The probable source of these compounds is organic matter combustion due to low temperature . This pattern of concentration has been seen by other researchers such as Bishnoi et al. , Ma et al. and Chung et al. . It is essential to identify the origin and potential sources of PAHs in the environment to assess the environmental risk. 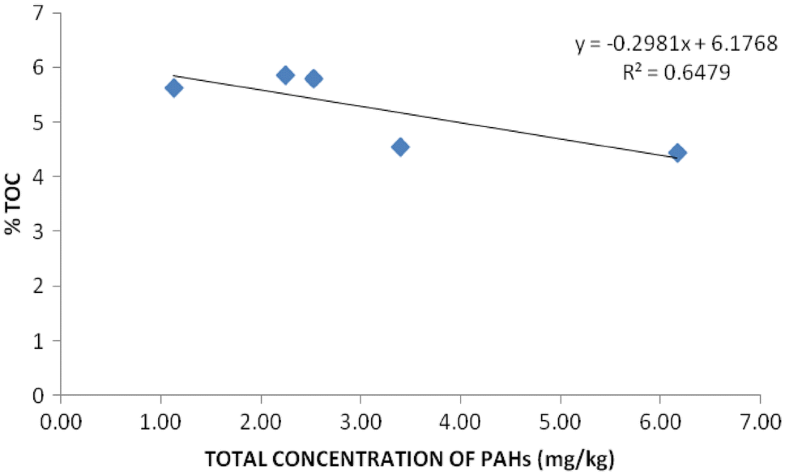 According to Mastral and Callen , PAH of petrogenic sources are characterized by the predominance of Low Molecular Weight (2 or 3-rings) PAHs (LMW PAHs) while PAHs from pyrogenic sources are characterized with High Molecular Weight (4–6-rings) PAHs (HMW PAHs). This is because LMW PAHs are generated at low to moderate temperature such as biomass combustion while HMW PAHs are generated at high temperature combustion such as vehicular emission. Diagnostic ratios have also been used to distinguish the sources of PAHs due to their stability, physical and chemical attributes [21, 31]. PAHs diagnostic ratio was calculated from the readings and result presented in Table 6. Table 6 shows the diagnostic ratios of the PAHs obtained in this study and their possible sources. The ratio of anthracene/(anthracene + phenanthrene), in all the study areas in both soil and water were > 0.1 except RCC (in rainy season) and NK in water sample (dry season) which had no valuable result for source identification. This implied that the source of PAHs was from pyrogenic sources due to wood combustion and other biomass. Also, the use of Indeno(1,2,3-cd)Pyrene/(Indeno(1,2,3-cd)Pyrene + Benzo(ghi)Perylene) ratio gave values within 0.13–0.79 except NK (during the rainy season), EIW (water samples in both dry and rainy seasons) and RCC (soil sample during rainy season) which had no valuable result for source identification. This shows that the source of the PAHs were from mixed sources (petrogenic, pyrogenic and phytogenic sources). The ratio (LMW PAHs/HMW PAHs) could not be used to deduce the PAHs source because the LMW PAHs were not well distributed within the study area. The bulk of the LMW PAHs was contributed by naphthalene. Generally, the source of PAHs in both soil and water samples can be attributed to pyrogenic and petrogenic sources. where Ci and TEFi is the concentration and the corresponding toxic of individual PAHs and is the corresponding TEF value of one for benzo(a)pyrene . The TEQ of individual PAHs was calculated based on the toxic equivalency factor (TEF) values proposed by Nisbet and LaGoy  as shown in Table 7. Benzo(a)pyrene was detected in all the soil samples during both seasons. The highest concentration was detected at RCC (0.43 mg/kg) during dry season and GB (0.32 mg/kg) during rainy season. BaP was also detected in all the water samples collected except from RCC during the dry season. The highest concentration was detected at EU (0.17 mg/l) during dry season and NK (0.24 mg/l) during rainy season. International Agency for Research on Cancer (IARC) and the United States Environmental Protection Agency (US EPA) reported Benzo(a)anthracene (BaA), Chrysene (Chr), Benzo(b)fluoranthene (BbF), Benzo(k)fluoranthene (BkF), Benzo(a)pyrene(BaP), Indeno(1,2,3-cd)pyrene (IcdP), Dibenzo(a,h)anthracene (DbA) and Benzo(ghi)perylene (BghiP) as possible human carcinogens. These possible carcinogens were detected in the samples. 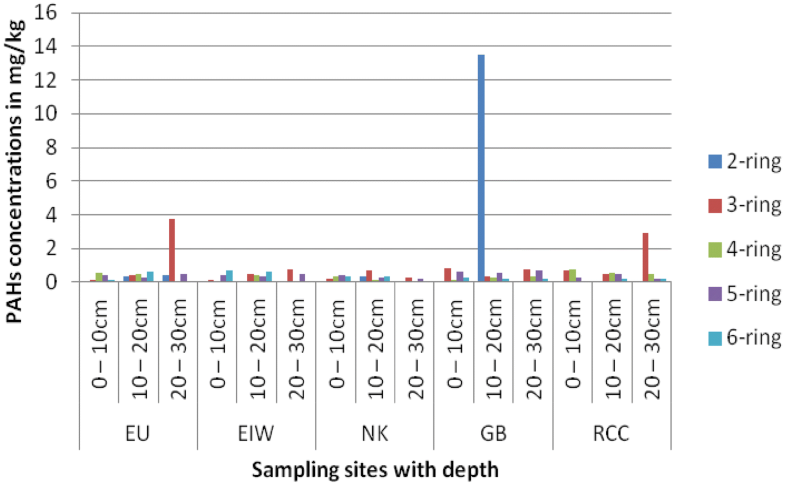 The computed TEQ values were higher in the soil samples than the water samples. The extent of carcinogenic burden of the different study area was also determined by comparing the % of ƩPAHcarc in Ʃ16 EPA PAHs for all the study areas. This was used to assess the risk of long term adverse health effect. Table 4 reveals that Edem Udo automobile repair workshop had the highest carcinogenic burden with a percentage of 55% (0–10 cm), 39% (10–20 cm) and 43% (20–30 cm) in the dry season and hence a high long term adverse health effect. The study area with the lowest carcinogenic burden was Grace bill automobile repair workshop with a percentage of 42% (0–10 cm), 11% (10–20 cm) and 26% (20–30 cm) in the dry season. Thus moderate adverse health effect. In the rainy season as revealed in Table 5, Etebi idung Iwak automobile repair workshop had a very high long term adverse health effect with percentage of 83% (0–10 cm), 65% (10–20 cm) and 38% (20–30 cm). This really posed very serious threat to the environment and people consuming the vegetations around it. The study area with the lowest carcinogenic burden was RCC automobile repair workshop with a percentage of 32% (0–10 cm), 34% (10–20 cm) and 20% (20–30 cm). This also indicated a moderate adverse health effect and hence calls for adequate monitoring. The calculated total BaPeq values in this study at different sampling sites varied from 0.2990 to 0.8398 mg/kg (Dry season) and 0.3682–0.9746 mg/kg (rainy season). As seen in the table, total BaPeq values in the water samples varied from 0.0515 to 0.2438 mg/l (Dry season) and 0.0645–0.2746 mg/l (rainy season). The fate of PAHs in soil is strongly influenced by physicochemical properties such as pH, bulk density, particle density, porosity and Total Organic Content (TOC). This plays important roles in the partitioning of PAHs in the soil and its percolation into the water bodies around the contaminated environment. A result from the measurements of soil physicochemical properties is presented in Table 8. The pH levels in soil were on the range of 5.24–6.20 during the dry season and 5.22–6.91 during the rainy season. There was no significant trend shown for the soil pH among the sampling sites. There was an increase in pH in the rainy season in all the sampling sites except in soil samples from GB and EIW at depth of 20–30 cm. In contrast, the temperature of the soil was higher in the dry season than in the rainy season and ranged from 26.0–27.4 °C in the dry season and 25.5–27.1 °C in the rainy season. In the water samples, the temperature was within a range of 26.1–27.8 °C in the dry season and 25.8–27.4 °C. The temperature is an important variable that affects the microbial activity, decomposition of organic matter, soil or water chemistry and soil moisture levels. Soil covering have a more complex relationship to soil temperature because they are in contact with the soil. The soil temperature depends on whether they absorb, reflect or trap solar energy. Soil covering in automobile repair workshops are usually darker coloured as such will absorb more solar energy as heat and transmit it to the soil below, hence the temperature difference. Soil moisture content varied significantly with site. From Table 8, it is found that the soil at Grace bill automobile repair workshop had the highest moisture content of 1.14 (0–10 cm), 0.82 (10–20 cm) and 0.75 (20–30 cm) in the dry season. This can be attributed to insufficient aeration of the soil that might be due to the displacement of air in the oil-spilled soils. This probably encourages water logging and reduced rate of evaporation. The moisture content of the soil samples decreased with depth in all the soil samples. From Table 8, it is seen that the range of moisture content was from 0.40 to 1.14 in the dry season and 0.48 to 0.99 in the rainy season. The greater the moisture content of the soil, the greater its ability to transport numerous substances such as harmful pollutants. This will also increase its percolating power of washing substances from the topsoil and depositing them lower down the soil profile. From Table 8, the values of bulk density obtained ranged between 1.15 and 1.36 g/cm3 in dry season and 1.20 g/cm3 and 1.36 g/cm3 in the rainy season. The values were higher in the rainy season than in the dry season showing less pore spaces for transport of pollutant from the soil to the underground water. This reveals why we have higher concentration of pollutant in the dry season than in the rainy season. The spent oil in the automobile repair workshop affected the soil property by increasing the bulk density because of the settling of oil in the pore spaces of the soil to increase both the soils wet and liquid content. The %porosity of the soil had values between 48 and 57% in the dry season and 48% and 55% in the rainy season. The %porosity had no regular pattern with regards to the depth of the soil. Soil particle density varies according to the mineral content of the soil depending on the land use. As seen in Table 8, the soil particle density had no regular pattern with regards to sampling season but increased with soil depth. The soil particle density had a range of 2.60–2.70 g/cm3 in the dry season and 2.51 g/cm3–2.69 g/cm3 in the rainy season. The variation with sites is due to the soil activities. TOC has an important influence on the distribution of PAHs in the soil as it also helps in the provision of binding sites for their adsorption in soil. As seen in Table 8, the TOC obtained varied between the sampling sites ranging from 1.29 to 8.40% in the dry season and 0.89–8.22% in the rainy season. Statistical analysis of correlation carried out to investigate the relationship between total PAHs concentrations and TOC% as seen in Figs. 6 and 7 indicated a significant correlation (r = 0.65 in the dry season and r = 0.28 in the rainy season). Therefore TOC was a factor affecting PAHs distribution in the soil. The effect of depth profile on PAHs was investigated by examining three different soil depths (0–10 cm, 10–20 cm and 20–30 cm). This was evaluated by correlating soil depth with total PAHs concentration and presented in Tables 9, 10, 11, 12 and 13. At P < 0.01 and 0.05, the total PAHs showed significant interactions although they were negatively, positively and weakly significant. During the rainy season, the total PAH concentration increased with increase in depth at EU (0.890), EIW (0.721), RCC (0.800) and GB (0.020) study areas. The correlation coefficient between soil depth and NK sampling site was negative (− 0.746) indicating a decrease in total PAH concentration with depth. This might be due to the effect of soil pH and bulk density which decreased with depth. In the dry season, most of the site had a negative correlation coefficients such as EU (− 0.596), EIW (− 0.545) and RCC (− 0.952) sampling sites. This might be due to the effect of other soil physical properties. In NK and GB sampling sites, there was a weak correlation with correlation coefficient of 0.212 and 0.281 respectively. Analysis of Variance (ANOVA) was obtained using Statistical Package for Social Science (SPSS) 20.0 and presented in Tables 14 and 15 to evaluate the significance difference between the total PAHs at the sampling sites for both rainy and dry season. In both rainy and dry seasons, the result showed that there was a significant difference in the concentration levels at 95% confidence interval. 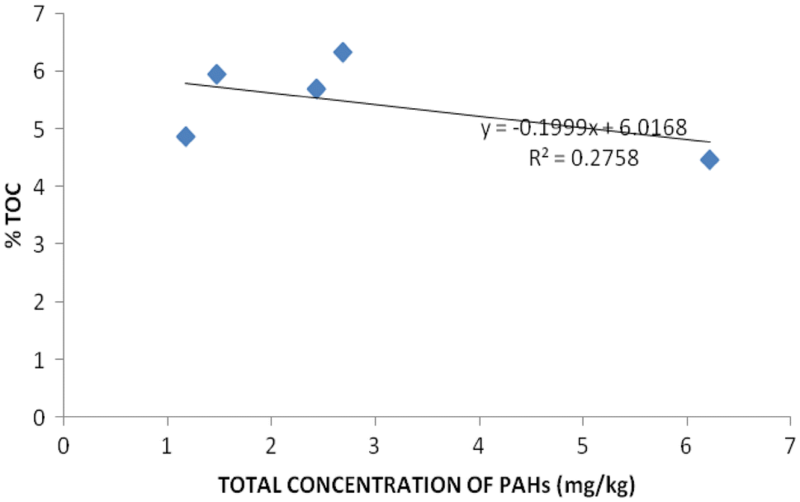 This implied that there was pronounced variation in PAH concentration level in the soil samples collected during the monitoring period. In this study, the PAHs distribution profile in soils within automobile repair workshops and underground water around its vicinity indicated moderate to heavily contamination with PAHs. The Ʃ16 EPA PAHs detected in the soil samples in the five automobile repair workshops ranged from 0.82 to 12.98 mg/kg and 0.47–14.85 mg/kg for both dry and rainy seasons respectively. The Ʃ15 EPA PAHs detected in the water samples ranged from 1.71 to 16.07 mg/l and 1.07–12.97 mg/l for both dry and rainy seasons respectively, a value which was above the ATSDR levels of 1.0 mg/kg for significant contaminated sites. Also following this European Commission classification, it can be said that the soil and water in this study area is moderately to heavily contaminated . The value of the total BaPeq for the soil samples at the five sampling sites ranged from 0.2990 to 0.8398 mg/kg and 0.3682–0.9746 mg/kg for both dry and rainy season respectively. The BaPeq for the water samples around the sampling sites ranged from 0.0515 to 0.2438 mg/l and 0.0645–0.2746 mg/l for both dry and rainy seasons respectively. This implied a moderate carcinogenic burden and thus, low health risk. The calculated values obtained from diagnostic ratios and individual PAHs correlation at P < 0.01 and 0.05 indicated that the PAHs in this study were from both pyrogenic and petrogenic sources. It can be concluded that automobile repair activities had effect on the soil contamination with PAHs. The correlation between total PAH concentration in soil and water for both seasons indicated that the PAHs in water was contributed by the PAHs in soil and the effect of depth on PAH concentration also confirms this. It can be concluded that automobile repair activity has a moderate effect on the soil as well as the underground water around it. Therefore boreholes should be sited distance away from the automobile repair yards to enable its suitability for domestic, irrigation, recreational and industrial usage. The authors wish to thank the Research and Publication Committee of Akwa Ibom State University, Ikot Akpaden, Mkpat Enin for funding this study.